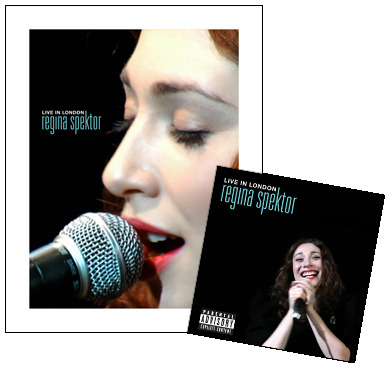 LIVE IN LONDON is the first live recording and concert film from acclaimed artist Regina Spektor. Captured mainly at London’s famed Hammersmith Apollo Theatre, LIVE IN LONDON features 22 remarkable performances that span Spektor’s brilliant catalog of music, including three new songs that have only been performed live (Silly Eye-Color Generalizations, Bobbing For Apples and Love, You’re A Whore). LIVE IN LONDON was recorded during Regina’s UK tour in support of latest album. On Monday, November 22 Regina will be appearing at The Greene Space for a taping of WNYC’s Soundcheck with John Schaefer. Tickets for the show are available now for a very reasonable $10. On the same day Regina plays The Greene Space, the Live In London CD/DVD drop in the US via Warner Reprise. If the big screen is more your thing, the film version of Live In London will run theatrically from November 19-25 at the Village East Cinema in Manhattan. Other selected US cities will have single day screenings, check here for the full schedule.